Five forged steel, chrome-finished open-end wrenches that come graced in a sensuous, these babies will make you both pleased and eager to pull your tool and/or part. Okay, we couldn't help that one! Available in both standard ( SAE ) and Metric applications, priced at $39.95, and painstakingly crafted to perfectly fit the palm of your hand (we're serious this time! ), these beautiful creatures are the perfect tools for the perfect tool, YOU! 1/2" – 3/4" Drop forged chrome plated. Please tell me where I can purchase these from. 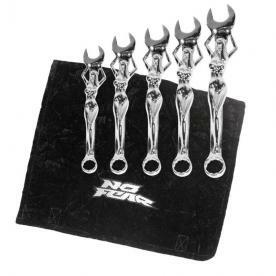 I'd like to order a set of these wrenches but I have no idea where I can get them.